Modern House Plans by Gregory La Vardera Architect: Vermont Plat House - Frame On! 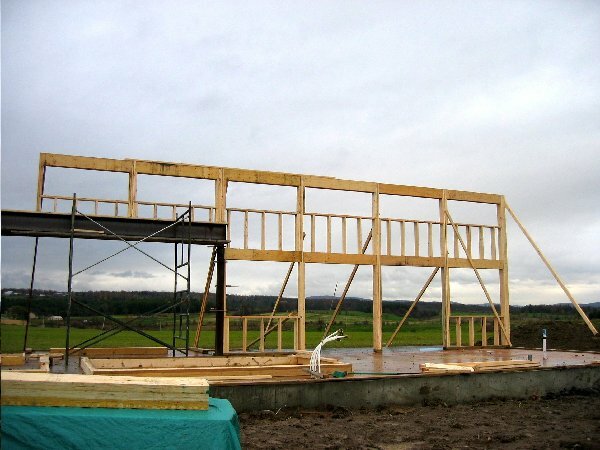 Vermont Plat House - Frame On! Framing moves along.. ..even in the rain. A little downpour may have stopped the progress for the day, but it moved along none the less. The upper wall is now being framed out over the steel beam. The snow load for this site in Vermont was somewhere between 40 and 50 lbs per square foot. With the possibility of local variations you err to the higher figure. That beam has to carry the potential load across the entire living room, hence the sizable piece of steel. It will be a unique Plat House, that is for sure.